Biryani is a classic Indian origin dish famous all over the world. Chicken Biryani is everyone’s favourite; the flavour and aroma makes it irresistible and a hearty “all in one meal”. In India, each community and region has its own unique style of preparing Biriyani. Thalassery Biriyani/ Malabar Biriyani, Hyderabadi Biriyani, Lucknowi Biriyani, Thalapakittu, Dindigal Style, Bombay Biryani, Madras Biiyani are all different and incomparable. It is a wholesome meal and you can serve some appetizers like Minced meat roll, Chicken 65, Chicken fry, Squid fry, chicken cutlets, fish cutlets and serve this as main course. Biriyani can be made with any meat like Chicken, Mutton, Beef, fish, Egg or Prawns. Pulao made with vegetables, Mushroom or Paneer is also called as Biryani in India. You will like my flavourful Kerala Fish Biryani, another delicacy from God’s own country. 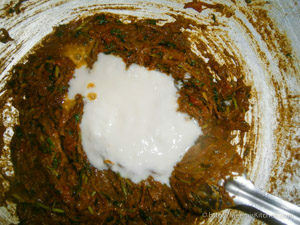 In Kerala, there is another popular Biriyani called Kappa Biriyani prepared with Tapioca and Beef ribs. 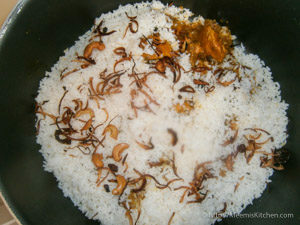 While making Biriyani, Rice plays an important part. Aromatic long grained Basmati Rice, Khaima/ Jeerakasala rice etc. are used according to each region. Cooking of rice is also important. It should be cooked most delicately so as not to break the rice. Thalassery Chicken Biriyani, Fish Biryani, Ghee rice and Mutton Biriyani are quite popular all over the world. The aroma and flavours make it a hearty meal and the taste stay in your tongue and mind for long. 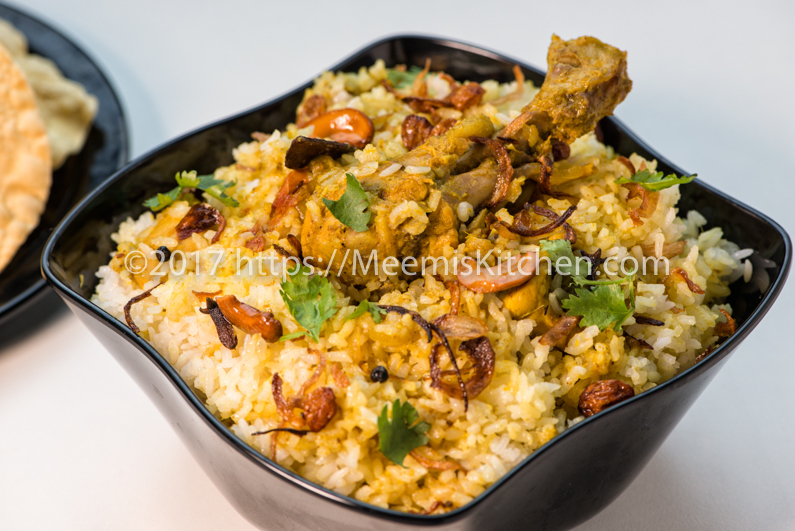 Thalassery Chicken Biriyani has special spices that provides a distinctive flavour to the Biriyani and also uses Jeerkashala/ Khaima rice for preparation, which makes it unique. 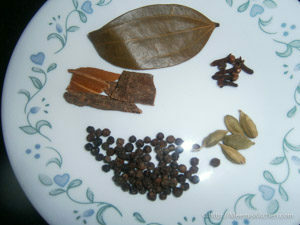 It is quite simple to make, and you can make extra Masala and store in an airtight container for later use. This is a real delight for all Biriyani lovers. Kerala is famous for its Thalassery Biriyani and Malabar Biriyani. Here is my version of simple and easy Thalassery Chicken Biriyani. Enjoy with your family and friends! Wash and soak the rice in water for an hour. Drain and keep aside. Heat oil + Ghee in a pan and fry the cashews, Kismis and onions to golden brown, drain and keep aside. Pour oil and ghee in a non-stick Biriyani Pot (I use non-stick as the rice won’t break). Add Cardamom, Cinnamon, Cloves, Bay leaf, whole pepper to oil followed by rice. Fry the rice for some time. Add Boiled water, enough salt and lime juice and cover and cook on low flame till the rice is fully cooked and the water is dried. Keep it half open for cooling. 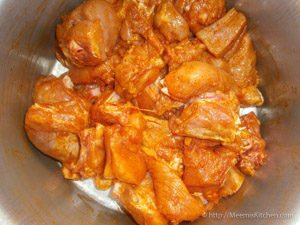 Clean and wash the chicken pieces and drain. 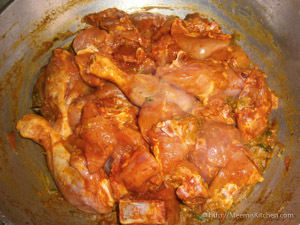 Marinate with turmeric powder, Chili powder (optional), Garam Masala and salt for an hour. Heat enough oil and ghee in a Kadai, add few curry leaves. Now add the sliced onions and sauté till limp. 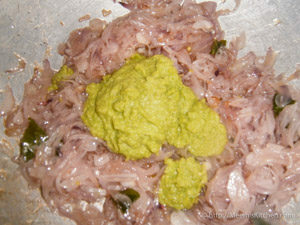 Grind Ginger, garlic and green chilly together; add this paste to onion and sauté for some time. In a blender, grind all Masalas – Turmeric Powder, Cardamom, Cinnamon, Cloves, Perumjeerah, Jeerah, Shajeera, Star anise, Nutmeg and mace. 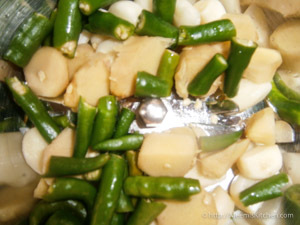 Add this to the onions and fry for some time. 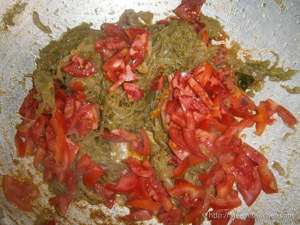 Now add chopped tomatoes and continue frying till they are mashed. 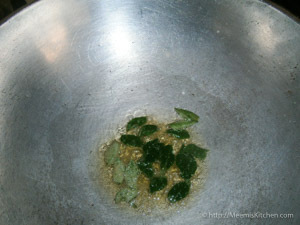 Chop mint and coriander leaves and add to the gravy then add curd and salt. Mix in the marinated chicken pieces and combine well. Pour one and half cups water and mix well. 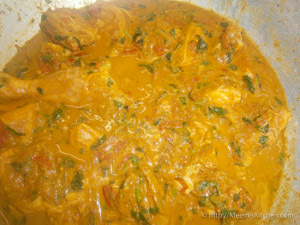 Once the gravy starts to boil, cover and cook on low flame till the chicken pieces are soft and the gravy becomes thick. You may grind little coconut and cashews and add to the gravy to make a thicker gravy (optional). 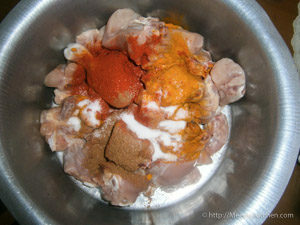 Once the chicken korma is ready we can start layering. Layer the rice and chicken in a thick bottomed Biriyani pot. Sprinkle the fried Onions, cashews and kismis and saffron milk in between. Top layer should be covered with fried onions and cashews and chopped coriander and mint leaves. Cover, seal and cook it on a low flame for 10- 15 mts if you want to make dum. You may also cover it with foil and bake in oven for 10 – 15mts. Enjoy your Thalassery Chicken Biriyani with Raita, Pappad, Mango chutney and Lime pickle. For Raita, chop Onion, squeeze and add chopped cucumber and a green chilly, add little grated carrot, tomato and add thick butter milk and salt. Sprinkle with coriander leaves. 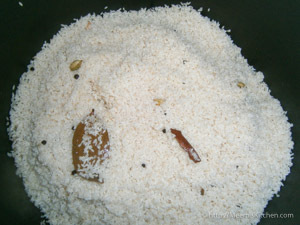 Jeerakashala rice/ Khaima rice is used for Thalassery Biriyani. Chicken Korma should have little gravy to mix in the rice. If required, add water to have enough gravy. Use small tender chicken for best results. You can add little colour to the rice by adding saffron strands to milk or adding little yellow food color. Always prepare Rice first and allow to cool. It is important to cool the rice before layering so the rice grains stay intact. The onions and tomatoes should be mashed nicely before adding the chicken pieces to the gravy. Grind little coconut and cashews and add to the gravy to make a thicker Korma. It tastes awesome too! 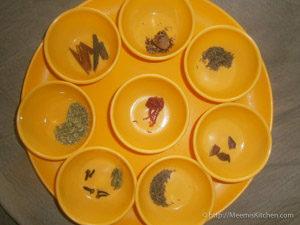 Check how to make Garam Masala at home for the perfect taste. 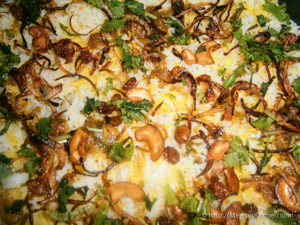 If you are looking for an easier chicken Biriyani recipe, check Quick and easy Chicken Biriyani. Have a hearty lunch or Dinner with Thalssery style chicken Biriyani . Enjoy with Mango chutney, Raita, Pappad and Lime pickle. God Bless! !